I crochet very fast and never have a problem finishing something quickly or getting my orders out on time! This does, however, make me a very, very bad blogger! Once my hands get going I forget to take photos or write down the pattern. At this stage there are almost 60 patterns on my to-do list. The Neon Shawl is something I made in OCTOBER 2013. It is one of those practical pieces that matches with most of my casual clothing - and it is just perfect to drape around the shoulders while socialising outside at night! The Neon effect is achieved by alternating colour stripes between dark grey and black stripes. Very simple! You can use any DK acrylic! The colours do not need to be an exact match, and you will find that most brands stock colours similar to the ones I used. Foundation & Rows 1 - 55 Follow the pattern for the COSMOS FIELDS SHAWL (using the above stripe composition) repeating the last row twice more for Rows 56 - 57. (We are now going to do the base edging - the longest side of the triangle which is formed as you do your rows) Into same 1ch space work 3hdc; sl st into side of first dc post, (2ch, 1hdc, sl st into side of next dc post) repeat to last dc post, 3hdc, sl st into top of 3ch at start of row to end. 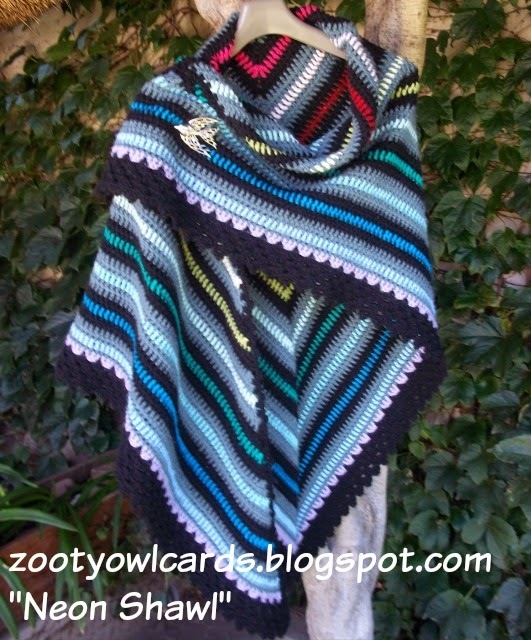 Gorgeous shawl in beautiful colors. Thanks for sharing the pattern.